For 15 years, I commuted 100 miles a day taking my children to schools in Memphis, Tennessee. During this time, I also worked with my husband in his business. As a college student, I toyed with the idea of becoming an art major but chose sociology and social work instead. A huge drawback was my lack of exposure to many facets of the larger art world and confidence that I could make a living in it. With strong creative leanings, I often created art for fun by drawing, sewing (making Halloween costumes for the kids) or quilting. Over ten years ago, I seized an opportunity to take a lampworking course and began to make glass beads. 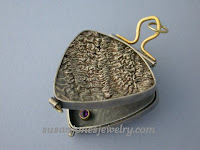 In trying to find a way to use all of the beads I had made, I took a silversmith course. A real passion for jewelry design developed and I have found myself wanting to learn everything possible in the mediums of metal and glass. At this point, my thirst for knowledge in these areas are pretty much unquenchable, so I continue to take classes, experiment by setting no boundaries within the two mediums and in general, am always working on expanding my knowledge and talents as an artist and designer. The greatest opportunity for me has been, without a doubt, the opportunity to exploit my creative side. I can’t fully describe the personal satisfaction that comes from being able to do something that I so deeply and completely enjoy doing and the opportunity to continually expand my knowledge only enhances that experience. Secondly, the people I have met through learning and working with this craft have taught me so much. There is an intimacy in having someone share their talents with you and teaching just because they want to share their knowledge and love of their craft to those whom they know will appreciate their perspective. As someone who has always lived and worked in the south, how do you think the region has inspired your designs? Living in several different areas of Mississippi, I was fortunate to be exposed to the proud and unique cultural heritage found in each region of our great state. My childhood was a learning experience in itself, as I was surrounded by fascinating people from all walks of life who contributed to our state’s art history in many and varied ways, from handcrafted quilts in the hills to the blues music of the delta. These experiences have influenced the way I see life, and shaped my taste in the arts. Anyone living in the south can tell you that the Southern woman loves a classic, beautiful, stylish piece of jewelry that will stand the test of time. 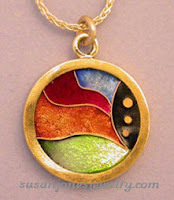 She wants to be able to wear it with her jeans or to a party and have it be the perfect accessory for both occasions. The influences of the south have inspired me to want to create that timeless piece of jewelry. Aside from the culture in which I grew up and now live and work, my greatest influences have been my family and my teachers. My father, a Methodist minister, always worked with his hands outside of his profession, my mother is a painter and my grandfather was a blacksmith. Because of them and their influence on me, I’ve been able to cultivate what I feel must have been an inherent creative ability. The greatest influencers beyond my parents have been my teachers. Barbara Joiner, resident jewelry/metal artist at John C. Campbell Folk School, has been wonderful in sharing her keen knowledge and ability to work with metal. Other outstanding teachers that I would mention are: DX Ross (deceased), Don Viehman, Tom McCarthy, Doug Harling, Patsy Croft, Mary Chuduk and Ken Bova. You mention that you have a connection to every piece you make…. I only make something that I would be willing to wear myself. When I work on a piece, I must have a certain love for it to make it. The creativity, the detail, the stone, the difficulty and the finished product all go hand in hand and they must come together in a way that is “right” for me. I have at times found myself holding a piece for a time just because I love it and can’t bear to part with it just yet – much as one would want to hold onto an old friend knowing that for various reasons you would ultimately have to part ways. It is rewarding to know that someone else is enjoying my work long after I have “entrusted it” to them. Nothing makes me happier than to continue receiving positive comments about a piece long after it has left my shop. After being a student at the John C Campbell Folk School, you will be teaching there now! What do you think is important about becoming a teacher? I love the idea of sharing my knowledge and passion for my work. It will be especially meaningful to know that I have influenced someone in a positive way, just as others have positively influenced me. Also, there is a sense of achievement — a certain satisfaction of knowing that I have met the approval of my peers to the point of being considered skilled enough to teach. -What do you find most interesting/challenging about being an artist and also a business person? The challenge is to make what I love, which is usually something that stretches my imagination and abilities, and have it still be affordable. Narrowing my targeted market is not an easy job. Do I want to make something affordable for most of the people that I see or concentrate on a select market that can afford what they want? While I won’t compromise craftsmanship, my goal is always to strike the right balance between quality and affordability. If you really love it, stay with it. 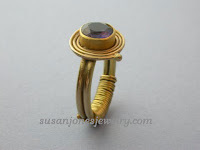 If one particularly enjoys the fabrication of jewelry, my advice is to study under as many great teachers as possible. Take notes in classes and for sure take your camera to document the process and materials they use. 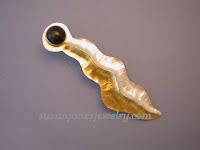 Susan’s work can be seen at her website: http://www.susanjonesjewelry.com/. A selection of her work is offered at a gallery called Taylor PO in Taylor, Mississippi. And, her jewelry is sometimes found at the Craftsmen’s Guild of Mississippi in Jackson, Mississippi and the National Ornamental Metal Museum in Memphis, Tennessee. It was a pleasure getting to know Susan! It is clear to me that she is a woman with a mission…first to quench a thirst for knowledge of the craft and now to hone it and pass it along to others. Congratulations to her! Previous post: Natasha Jade: Beautiful Buttoned and Beaded!